Nepal is home to eight out of the fourteen highest peaks in the world with cultures ranging colorful and intricate Hindus religion to the austerity of the Buddhist monasteries. From the breathtaking heights of the Himalayas the rivers crash down through the foothills, fed by monsoon rains and melting snow, on their way to the Great Plains of the Ganges. Nepal has many rivers for you to explore: Trishuli River (1 up to 3 days rafting/kayaking), Seti River (2 days rafting trip), Bhote Koshi River (1 day rafting trip), Kali Gandaki River (3 days rafting trip), Marsyandi River (1 to 2 days rafting/kayaking trip), Sun Koshi River (7 to 9 days rafting trip), Arun River (9 days rafting adventure combining with trek), Karnali River (10 days whitewater rafting and kayaking), Tamur River ( 10 to 11 days rafting adventure combining with 4 days trek). 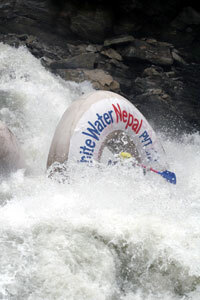 The water is warm and Nepal houses the world’s most thrilling whitewater in a wide range of difficulties with bug free beaches for camping to top it off. Our mountains, Rivers and everything inbetween creates a wealth of unlimited world class opportunities for great river rafting, kayaking, climbing, mountaineering, biking, hiking and the ever popular trekking adventures in Nepal. Nepal has something to offer to everyone. We are proud to share our wonderful country, culture and our many years of experience adventuring across Nepal with you. 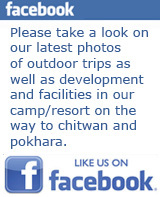 We offer unique opportunity to explore Nepal’s remote countryside from the river. 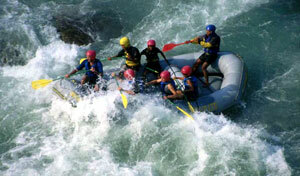 - Welcome for white water Rafting/kayaking, kayak school or just for easy boating experience in front of our camp/resort. There is no age limitation for fun boating! Our camp/resort is located at Charaundi by the bank of Trisuli River (main rafting/kayaking starting point of classic Trisuli river). Charaundi is 82. km from Kathmandu, 120 km. from Pokhara and 80 km. from Chitwan National park. - We welcome you at our camp/resort by the river for O/N staying & relaxation on the beach or just for coffee break while you are driving between main tourist destinations. 14 - 15 October, 24 - 25 October, 1 - 2 Nov., 7 - 8 Nov., 16 - 17 Nov., 28 - 29 Nov.
Whitewater Rafting/kayaking in 2 rivers are most recommended rafting trip from middle of October till middle of June for those who are looking for great rafting experience...11 to 13 April, 17 to 19 April and 24 to 25 April Please check for other trip dates.